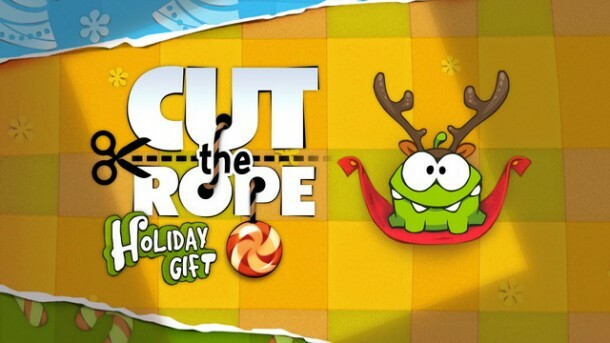 Just in time for the holidays, developers ZeptoLab’s has finally released Cut the Rope: Holiday Gift on Google Play. 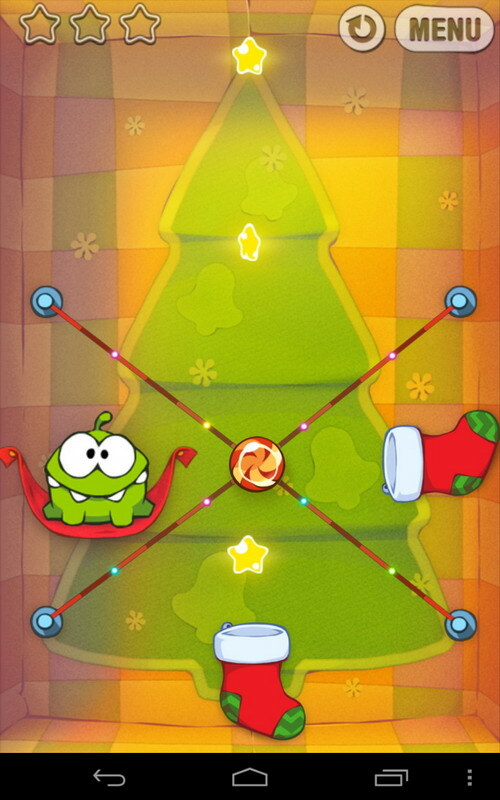 Really, the gift here is for the fans of the original and subsequent sequels, with 25 free holiday themed content that should appease Om Nom fans and newcomers alike. This standalone package, albeit short (only one box / 25 levels), plays close to the addictiveness and puzzle mechanic of the series. Story here takes a step back to gameplay. 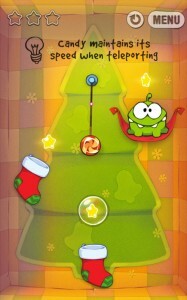 Like the original, players are tasked with dropping candy into the waiting jaws of adorable mascot, Om Nom. Holiday Gift employs the ‘if it ain’t broke, don’t fix it’ formula. This means the return of familiar tropes from earlier physic based puzzler in the series: slicing, cutting, tapping and avoiding obstacles with the end goal of stuffing candy into the creature’s mouth. Instead, minor change hinges mostly on the aesthetic elements in the game. This is of course, the obvious holiday themed filter over the game. 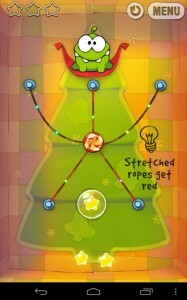 Visual tweaks such as the dangling ropes, are replaced by Christmas lights, reindeer ears for Om Nom, Christmas tree background and the removal of magical portal hats from Cut the Rope: Experiment, in favor of portal stockings. The overall presentation and visual style however, has remained relatively untouched since its first debut. 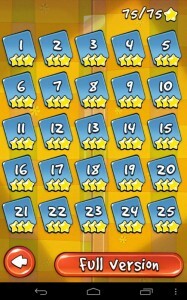 Like Angry Birds, every level ends with a determining three star rating. 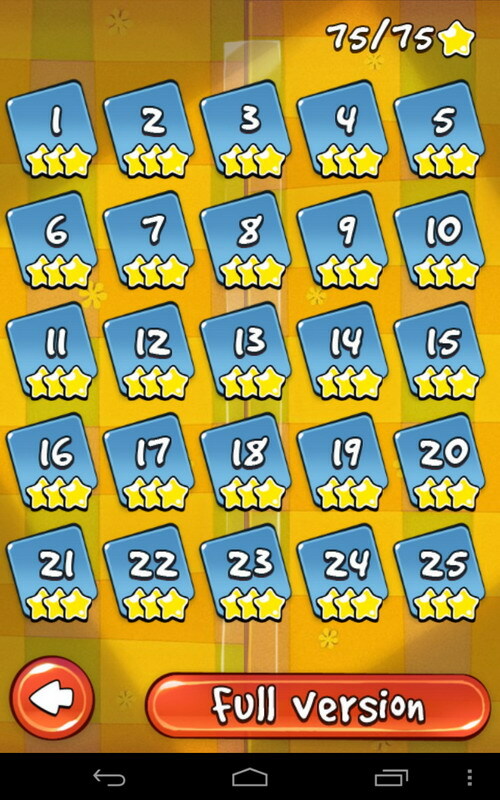 Unlike Angry Birds, these three stars are strewn out across the stage per level and are only acquired by collecting them throughout. This leads to a lot of trial and error gameplay as you attempt to figure out just how to nab that out of reach star in a stage. 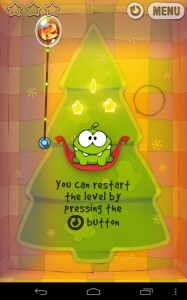 Perfectionist, familiarize yourself with the restart button. 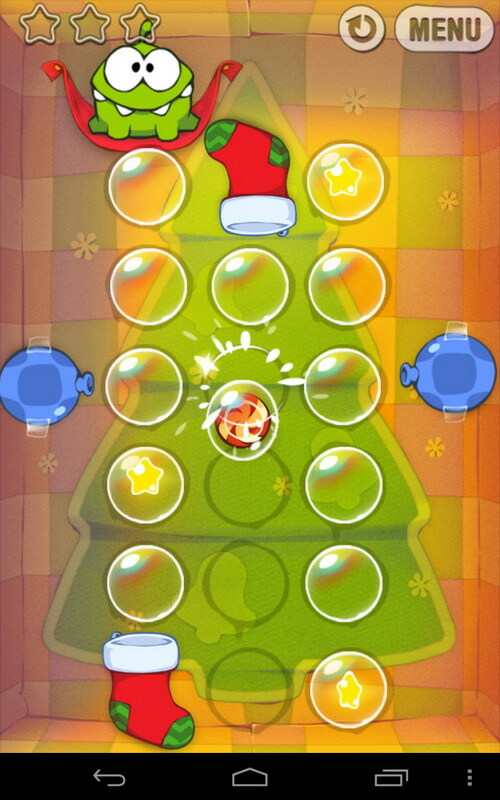 Once you solve a very difficult puzzle however, you get an overwhelming and very satisfying ‘AHA!’ moment that makes the accomplishment of three stars incredibly rewarding. 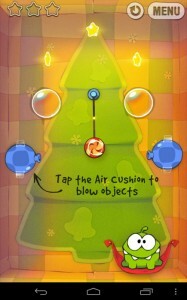 My main gripes with Holiday Gifts steam from recycling of the earlier levels, gameplay and mechanics. 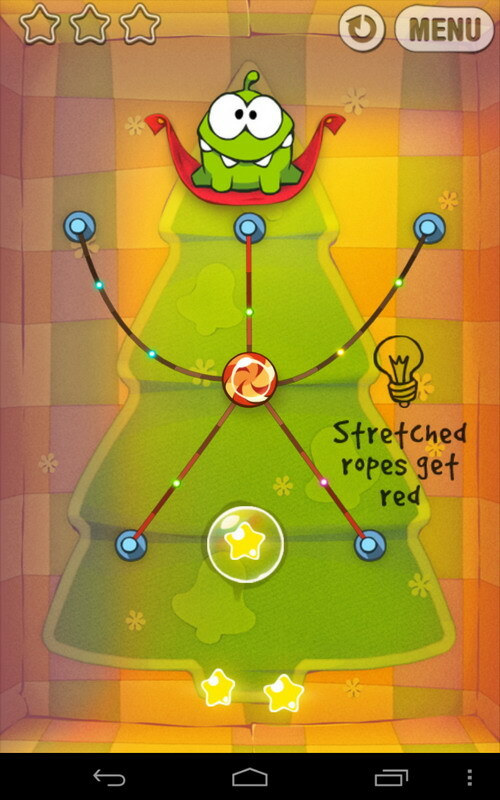 Most levels are literally a rehash of previous levels from Experiments and the original Cut the Rope and even the same process to solve them remain in tact, just fleshed out in a different coat of paint. 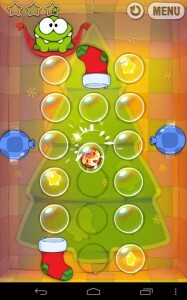 Fans and crafty gamers can blaze through this one in one sitting as the difficulty doesn’t ramp up past midpoint of the game. 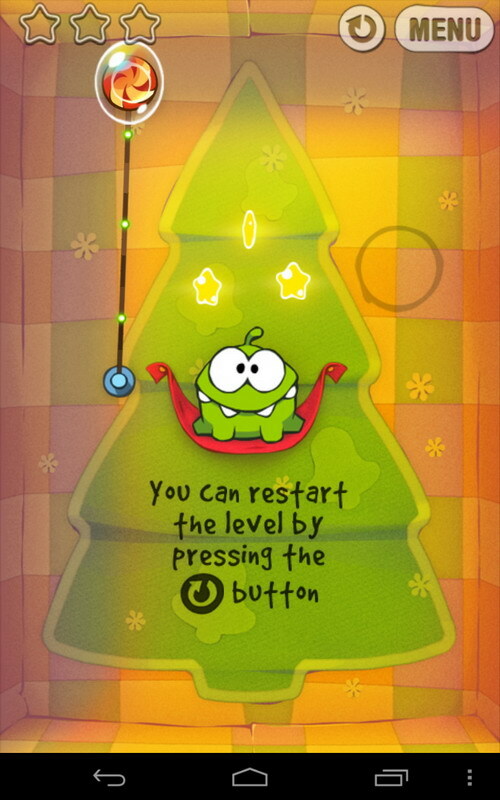 The first few levels act as introductory courses, a tutorial, making it accessible to anyone thanks to the relatively low learning curve. It’s pretty simple to pick up and play. 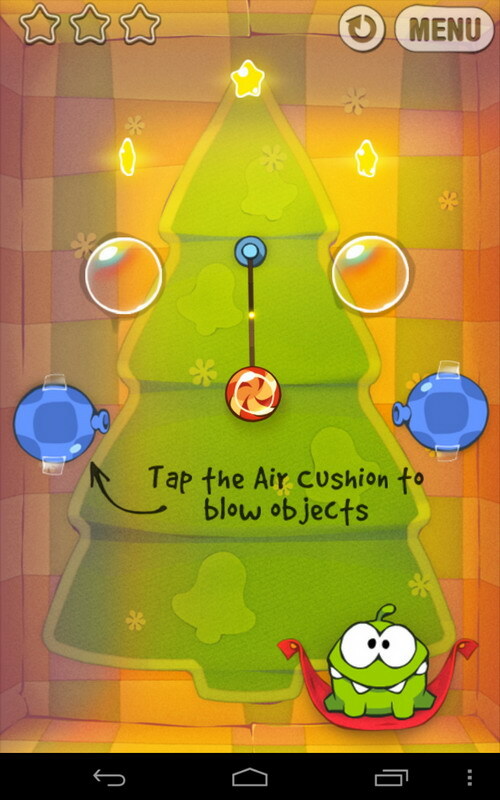 One thing to keep in mind, Holiday Gifts was first released in 2010, hot on the heels of the original so these minor flaws are easily overlooked. 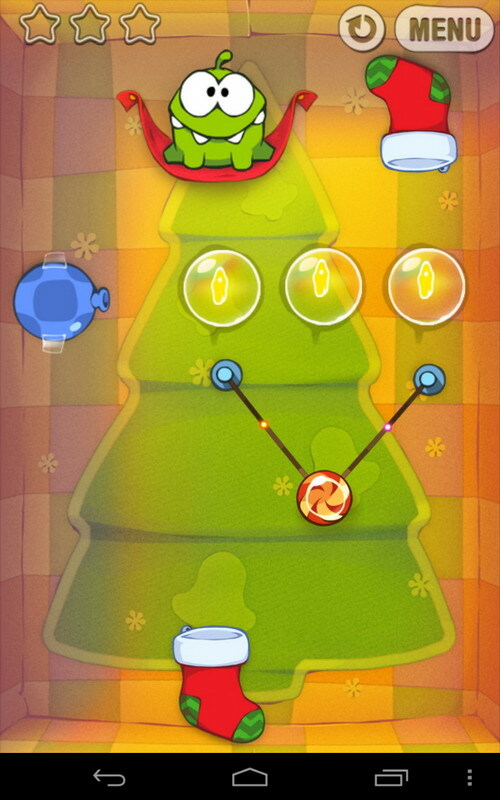 Still, one can’t help but feel that this was a chance for ZeptoLabs to add a more robust mechanics and gameplay. As this is a free game there is a minor (rarely obtrusive) ads though it rarely takes away from the game. 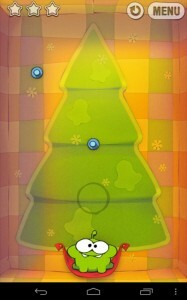 Despite its short length and reused levels , in all, the value (free!) 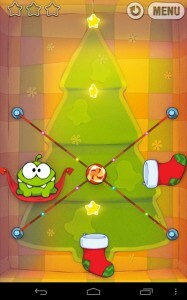 and enjoyment taken away from Cut the Rope: Holiday Gifts is well worth the download. Veterans may be somewhat underwhelmed but despite reused levels and mechanics, the series charms remain intact. If anyone is looking to shake up their winter festivities, Holiday Gifts is the perfect fit.